Home > What's New > ORDER / List all e-pill CADEX devices > Automatic Pill Dispenser (996024). Tipper included. No Monthly Fees. Locked Automatic Pill Dispenser with Tipper. e-pill Station for Home or Institutional Use. Pill Dispenser with Medicine Cup. Automatic Pill Dispenser and Organizer Station from e-pill Medication Reminders (SKU 996024). Dispense your medications in a cup. Locked automatic pill dispenser with Tipper. Up to 6 Alarms (6 Doses) per Day. Patent US 9,198,834 B2. Never Forget to Take your Medications Again! 30 DAY Money Back Guarantee. One Year Warranty by e-pill Medication Reminders. FREE Standard Shipping. Take your Pills from a CUP: Medications end up in a cup. 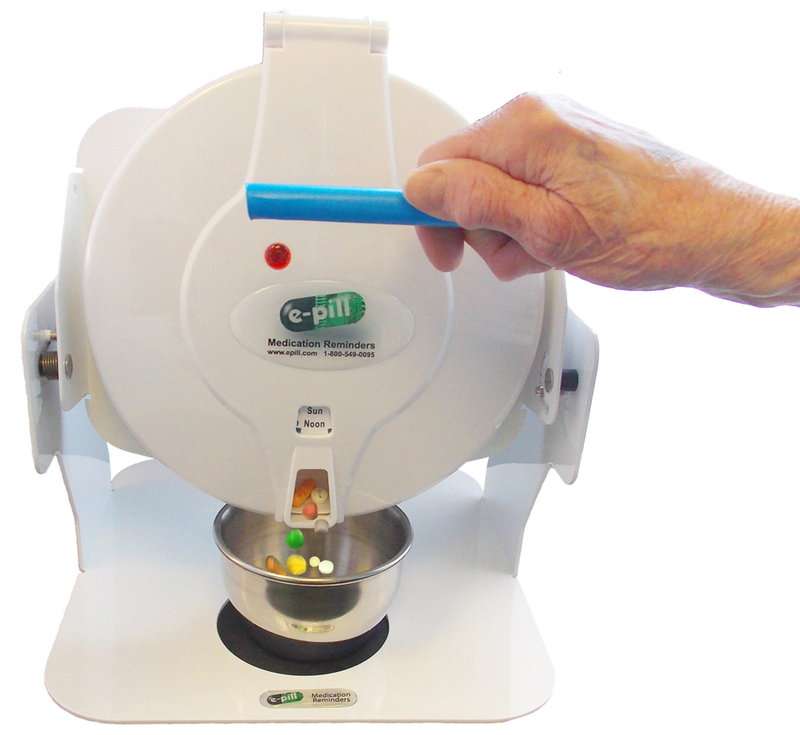 Dispensing Cup and Tipper Device is included with your e-pill Station. Purchase this e-pill Dispenser for patients with insufficient strength or limited dexterity to lift and dispense their medications using a traditional automatic e-pill dispenser. Works similar to a Kettle Tipper / Tea Tipper. Device can be screwed down to a table top. High pill capacity, up to 18 aspirin sized tablets per medication event. Stainless steel dispensing cup is included. Capacity: Holds 18 Aspirin sized tablets per Dose. Up to 6 Doses per Day. Alarm duration: up to 30 Minutes.